India has to effectively deal with this new insect that can devastate maize and a host of other crops. This pest has been seen in the Americas since several decades. Fall Armyworm larva feeding on maize crop. 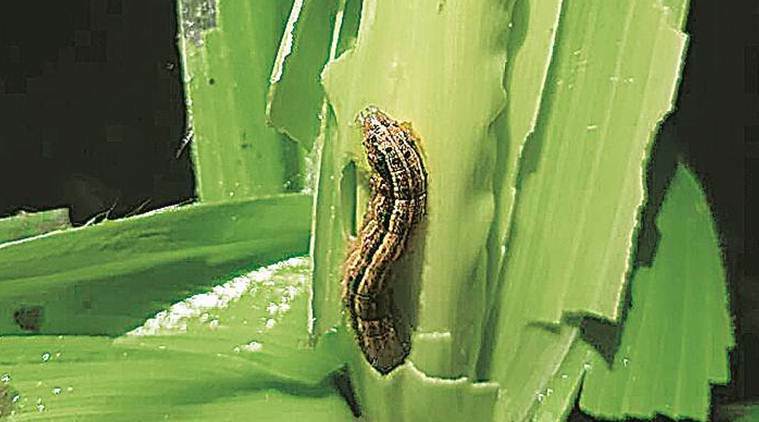 The occurrence of a new insect pest, Fall Armyworm (FAW, scientifically known as Spodoptera frugiperda) has been recently reported in Karnataka and also parts of Andhra Pradesh, Telangana, Tamil Nadu, Maharashtra and Gujarat. The pest — its female moth lays eggs and the caterpillars hatching from these eat parts of the host crop plants, before pupating and turning into new moths — has been detected mainly in maize fields. FAW is not new to the scientific community. This highly-destructive and invasive pest has been seen in the Americas since several decades, but its prevalence outside was noted for the first time in West Africa in early 2016. Since then, it has spread to 44 countries across the continent, barring North Africa. 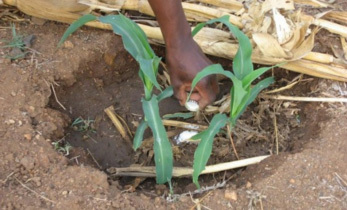 According to the International Maize and Wheat Improvement Center at Mexico (better known as CIMMYT), FAW has, over the last two years, damaged more than 1.5 million hectares of Africa’s maize crop. The adult moth of the pest migrates very fast — almost 100 km every night and nearly 500 km before laying eggs. It can, therefore, invade new areas quickly. Also, each female moth is capable of laying 1,500 eggs on an average. The entire lifecycle — from egg to new adult moth that lays fresh eggs — is completed in about 30 days during the summer months, while extending to 60-90 days in cooler temperatures. 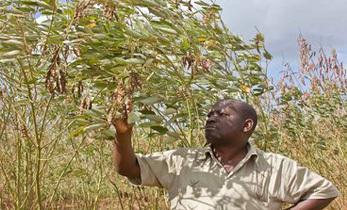 The pest thrives on a wide spectrum of host crop plants: maize, sorghum, rice, sugarcane, soyabean, vegetables, etc. Yet, FAW can be effectively managed through an integrated pest management (IPM) approach, adapted to the specific agro-ecology and cropping landscapes. 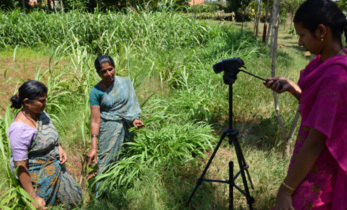 This article aims at sensitising farmers, extension workers, scientists and policy makers in India on sustainable management of the pest — through a “failing-it-in-the-beginning” approach. The FAW moth lays eggs on the plant’s foliage (leaves). The egg stage lasts for only 2-3 days in warmer weather. The next larval stage is the most dangerous one. There are six parts or “instars” in this stage, whose entire duration is from 14 to 30 days, depending on the temperature and humidity conditions. The destruction of leaves, stems or flowers of the crop plants by the larva through feeding happens mostly in the last three instars. Control over the pest is, therefore, best achieved early in its life cycle, rather than later stages. Once the larval stage is completed, the growing moth pupates in the soil — for 8-9 days in summer and 20-30 days in cool weather. The nocturnal egg-laying adults live for about 10 days, while most active during warm and humid evenings. 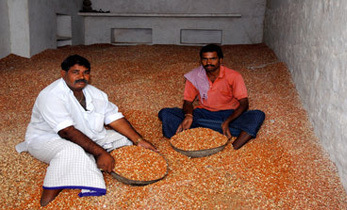 Scientists at the University of Agricultural Sciences, Bengaluru and the University of Agricultural and Horticultural Sciences, Shivamogga have scientifically validated the incidence of FAW in maize fields across various districts of Karnataka. There have been isolated reports of the pest’s presence in the maize-growing areas of other states, too. Fortunately, it has not caused any significant destruction as yet. But the fact that the moth can travel several hundred kilometres and lay eggs profusely during its lifespan calls for serious concern. Also, being a polyphagous insect that can feed on various plants, it would be wrong to view FAW only as a maize pest. In such a scenario, policymakers — more so, in the states where the pest has already been detected – need to nip the problem in the bud. A mass awareness campaign is necessary to build awareness among farmers and extension workers, on how to recognise the various stages of the insect and manage/control it with the right IPM interventions. This could be done through traditional means (pamphlets, posters, radio and TV broadcasts) as well use of mobile SMS and social media. The emphasis should be on generating awareness and not panic, even when FAW is noticed in any field. Surveillance systems by the public/private extension machinery, including through setting up traps (usually pheromone-based), can help effectively monitor the movement of the pest populations within the targeted geographical locations. Many organisations, both in the public and private sector, have been working on identifying, validating and developing technologies/agronomy practices to control FAW. The experiences and lessons learnt so far from Africa may be valuable to India: What they basically highlight is that there is no single solution for sustainable management of the pest. An effective IPM strategy would need to incorporate host plant resistance (through breeding), biological and cultural control, and use of environmentally-safer chemical and bio-pesticides for crop protection. Spraying of chemicals should be avoided unless the pest load has crossed economic threshold levels. Cultural control practices can work, especially when the FAW problem is still localised to particular geographies/crops. The eggs laid by the moths are discernible to the naked eye. Farmers can be trained to recognise and destroy the egg masses, so as to prevent the caterpillars from emerging. Biological control would, likewise, be an important component of an IPM strategy against any major crop pest. Quick identification and validation of biological agents, such as parasitoids, predators and entomopathogens against FAW, and release of well-validated bio-pesticides should be taken up on a priority basis. 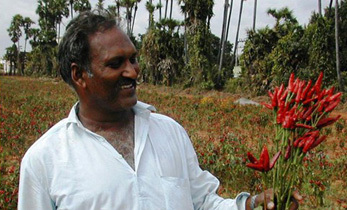 And finally, breeding: The Indian Council of Agricultural Research and institutions such as CIMMYT and ICRISAT (International Crops Research Institute for the Semi-Arid Tropics) have a vast array of germplasm in their gene banks and also varieties, which could be tested for native genetic resistance to FAW. This is a medium — to long-term strategy and requires effective coordination and resource commitments from the Indian Government, donors, and the private sector. In a world of climate change and increased global connectedness through trade and tourism, the frequency of invasive pest attacks is likely to only go up. It obviously calls for stepped-up phytosanitary and quarantine efforts to prevent the onset of transboundary pathogens and pests. 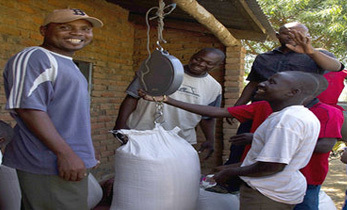 But that apart, effective monitoring, surveillance and early warning systems, coupled with an IPM approach, are vital to respond to any new insect-pest threat, in order to safeguard the crops and protect the incomes of mostly smallholder farmers. In the case of pests such as FAW, India must simply “fail” its spread in the beginning itself, through IPM and synergistic inter-institutional and multi-disciplinary efforts. Thankfully, this new pest is yet to siege farms in India, unlike in many parts of Africa. But that should not mean lowering one’s guard. On the contrary, the problem must be nipped in the bud.